Thank you for accepting me for the accountant [change as needed] position. Although I genuinely appreciate your consideration, at this time I feel it is in my best interest to seek a position more closely aligned with my level of experience and skills. Hence, I'm inclined to reject your offer at this time. I remain interested in future positions that would fully capitalize on my knowledge and expertise, should the opportunity arise. I kindly ask that you keep my name under consideration. Thank for your offer letter. 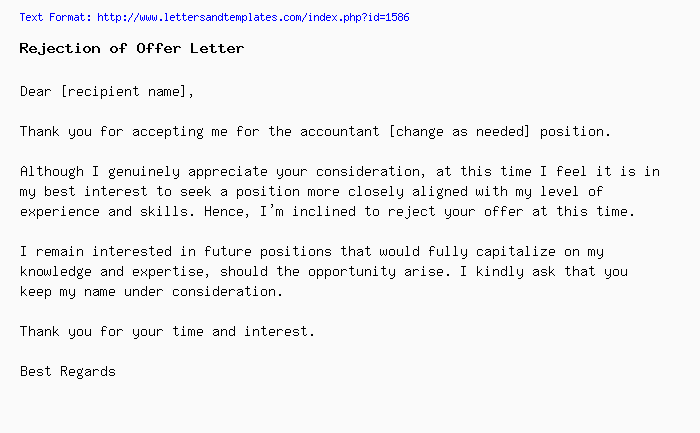 While I very much appreciate your interest, I feel that at this stage of my career I am targeting a greater challenge. My decision is based upon the fact that I have accepted a position elsewhere that is more suited to my qualifications and experience. I remain interested in future positions should the opportunity arise. I kindly ask that you keep my name under consideration for better matching roles. I want to thank you for interviewing me. You have a great team, and I would have enjoyed working with you.